Originally built as a brewery in 1854, Schwenk's Hall in Cimarron, New Mexico was converted into a gambling hall and saloon in 1875. Those wild west days are long gone and the place is now a curio shop. One of the curious items that we discovered was a vintage postcard with A Cowboy's Prayer written on it. The author of the poem was listed as Author Unknown. With our curiosity piqued we purchased the card and set about sleuthing this unknown author. Can a poet truly remain unknown? Oh, Lord, I've never lived where churches grow. In this dim, quiet starlight on the plains. Nor weak-eyed prisoner of wall and street. And I won't ask a life that's soft or high. Let me be square and generous with all. But never let 'em say I'm mean or small! Free as the hawk that circles down the breeze! Forgive me, Lord, if sometimes I forget. You know about the reasons that are hid. You know me better than my mother did. That stretches upward toward the Great Divide. — Charles Badger Clark Jr.
As it turns out, Author Unknown was a well known poet. Not only was he known as The Cowboy Poet he would also become the Poet Laureate for the state of South Dakota in 1939. Charles Badger Clark Jr. (1883-1957) is the "unknown author" of A Cowboy's Prayer. Clark's most famous poem, A Cowboy's Prayer, has often been reproduced with Author Unknown. The poem is from his 1920 collection of poetry, Sun and Saddle Leather. Though he was the author of several volumes of poetry and short stories, Clark's main source of income was derived from speaking engagements. His cabin in Custer State Park is a South Dakota Historic Landmark. PHOTO CREDIT: © Teresa Puente and used with the photographer's permission. 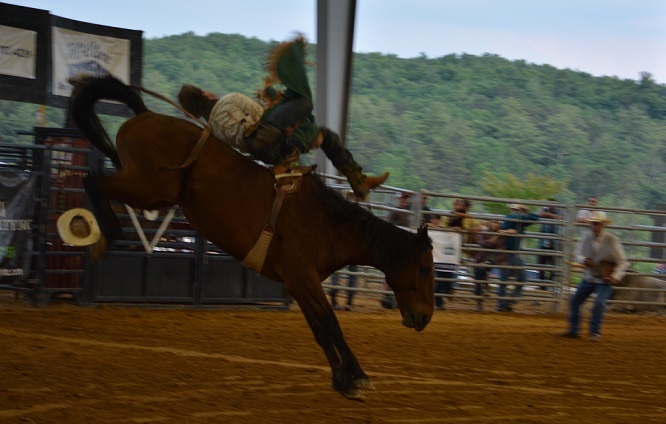 Rodeo Cowboy is one of the photos to be included in Teresa's co-authored book of her 2014 travels across the United States entitled, Americans.